Davies and Jones Optometrist have an enviable reputation for providing the best possible customer service. To prove this, two of its staff members are competing for the privilege of winning a much coveted AOP (Association of Optometrists) Award. Cath Coles and Lee Berbillion have each been nominated for Dispensing Optician of the Year. We looked in on them to find out how they feel about their nominations. The AOP Awards recognises and celebrates outstanding talent and contributions in the optical sector. A shortlist of finalists in each category of the competition is selected by a panel of expert judges, who represent all areas of optics. Finalists are then pro led on the AOP website when voting opens in September. AOP Awards winners will be revealed at a prestigious ceremony; a black-tie gala dinner, taking place on Sunday, 28 January 2018. Cath and Lee both undertook the same academic qualifications but Cath has always been in practice (front of house) whereas Lee spent more time in the lab and was much less customer facing. 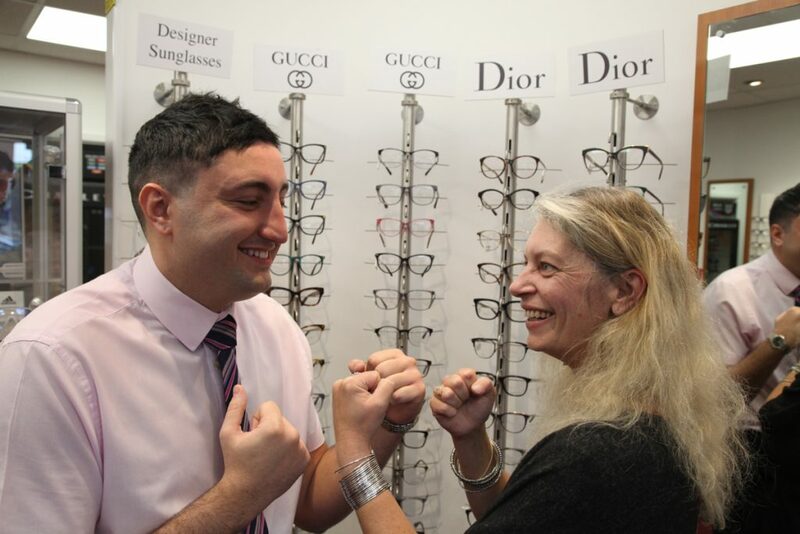 I started in Davies and Jones as a part-time optical assistant. I really enjoyed dealing with the public, and I was interested in the dispensing. I was then given the opportunity to take Optical Assistant courses with the Worshipful Company of Spectacle Makers. When I had completed those courses I was asked if I would like to go on to do the DO course to be a dispensing optician. I did my degree while working full time in practice and with two small children at home – it was exhausting but worth it! I then worked around three of our practices; got involved in frame buying, and then was lucky enough to be offered the position of Manager of Talbot Green branch. Also, I did one year working for a pilot scheme, delivering eye service to a special school in Aberdare (released from work one day a week), which was a real honour. I started off as a lab technician, after leaving school finishing my GCSEs. I worked in the lab for six years and progressed through the Worshipful Company of Spectacle Makers – doing courses from Level 2 to 4 NVQs and qualified as an SMC Technician. I worked alongside Geoffrey Lewis, who set up the lab 25 years ago and Bradley Watts, the lab manager now. I learnt a lot about spectacle glazing. Then, being very ambitious, I wanted to go onto a dispensing course. Under the guidance of Cath and Owain, I have progressed over the last three years to become a FBDO BSc Hons dispensing optician. Finally, I started a contact lens course this year. As you can see, both Cath and Lee deserve to win but which one will pick up the coveted award? You could help by casting your vote either on the AOP website www.aop.org.uk/awardsvote or by calling into the practice and making your choice known. Cath and Lee may be going head to head at the awards but they do see eye to eye on one thing – great customer service. Good luck both and may the best man, or woman, win!